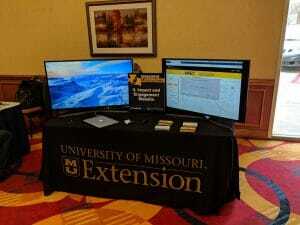 IPP analysts Gwen Sams and Zach Buckler and CARES (Center for Applied Research and Engagement Systems) Coordinator, Chris Fulcher, were on hand at the 2018 MU Legislative Day Showcase, held in the Magnolia Ballroom of the DoubleTree Hotel, Wednesday to provide information to the public about the new University of Missouri IMPACT portal-a searchable website inventory of MU programs, activities and educational opportunities. The IMPACT project is a way for citizens to connect with resources and opportunities for collaboration with the University. It also serves to demonstrate the many ways in which the University is committed to helping Missouri communities. The engagement effort highlights research, projects, programs, and events that interact with and benefit Missourians, such as continuing education programs, conferences, camps, and annual events. MU faculty and staff can use the IMPACT portal to add their engagement program /event to the inventory by following easy instructions on the website.